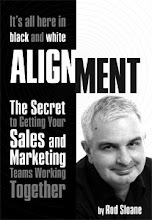 Sales and Marketing Alignment Blog from Rod Sloane: How to Barack Obama your business? The 44th President of the United States has much to teach us about how to market an unknown. Please don't tell me times are tough, think how it looked for Obama when he was announcing running for President. I'll be sharing these ideas with member of the IoD on Monday February 23rd in London. They think I will be delivering a presentation about writing a marketing plan but I will instead be delivering "How to Barack Obama your business?"